The demand in the global bonded magnets market is projected to experience a healthy CAGR of 7.0%, in terms of revenue, during the forecast period of 2017 to 2025. From its evaluated worth of US$1.37 bn in 2015, the valuation of the global bonded magnets market is estimated to reach US$2.50 bn by the end of 2025. Diverse application of bonded magnets, from electrical and electronics to automotive, aerospace, and medical devices, the demand in this market is also expected to gain new opportunities from the advent of additive manufacturing. Based on product type, the global bonded magnets market has been segmented into rare earth, ferrite, and hybrid. The rare earth bonded magnets segment is further sub-segmented into isotropic bonded magnets and anisotropic bonded magnets, whereas the market for ferrite bonded magnets is bifurcated into plastic ferrite and rubber ferrite. In the current scenario, economically available ferrite bonded magnets are extensively used globally. Rare earth bonded magnets is an expensive segment and although acquires a smaller demand-share of the market, it occupies substantial share in terms of value. 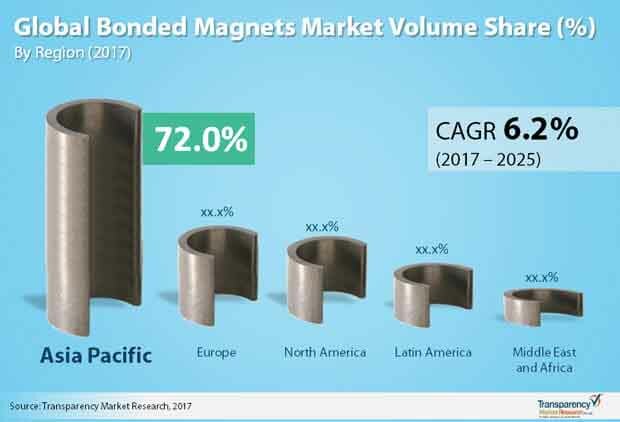 Hybrid magnets, a combination of ferrite and rare earth, is overcoming the high prices restraint of the global bonded magnets market, and is expected to favor the market throughout the forecast period. Application-wise, the global bonded magnets market gains maximum share of demand from the electronic and electronics category, both in terms of volume and value. Refrigerator door seals, fan motors, frictionless bearings, hand tool motors, watches, cameras, clocks, gaskets, and linear position sensors are some of the common electrical and electronic application of bonded magnets. The automotive sector, which also is in great health, is another cause of prosperity of the bonded magnets market. These magnets are largely used in applications such as motors for vipers, power windows, wheel speed sensors, power mirrors, crash sensor, chassis height sensor, sound deadening panels, fuel gauges, ignition magnets, tachometers, and speedometers. Geographically, in terms of volume, Asia Pacific served maximum demand in the global bonded magnets market in 2016. China solely contributed more than half of the global demand for bonded magnets, keeping Asia Pacific region in good stead. China has a rich deposit of rare earth metals such as samarium, neodymium, and dysprosium. More than 80% of rare earth agents are manufactured in the country. Japan and South Korea serve considerable demand for bonded magnets too, as these countries are the production base for semiconductor chips and products such as hard disks and other storage devices. The bonded magnet market in Asia Pacific is very fragmented as most of the production is done by small scale manufacturers. Asia Pacific produces and exports enormous amounts bonded magnets due to high availability of raw materials, especially rare earth mental, developed technologies, and cheap labor. As far as the potential of the bonded magnets market in other regions is concerned, North America and Europe collectively account for less than a quarter of the global demand, although the flourishing industries of electronics and automotive in the two regions will keep moderate opportunities open for the stockholders of bonded magnets market. In Europe, Germany has been detected as most profitable country-wide market, whereas The U.S. dominates the demand from North America, accounting for more than 85% of the regional demand. Some of the key companies currently operating in the global bonded magnets market are: Allstar Magnetics, Neo Magnequench, Arnold Magnetic Technologies, Alliance LLC, and Viona Magnetics, etc. In the near future, most of the vendors will aspire to increase their product portfolio to meet newer demand from distinct end-use industries. Bonded magnets are manufactured using a combination of polymer resin and magnetic powder. Several processes are used for manufacture of bonded magnets such as calendaring, injection molding, extrusion, and compression bonding. Compressing bonding process is prominently used for manufacture of rare earth bonded magnets, whereas calendaring and injection molding is used for manufacture of plastic and rubber ferrite. These magnets can be manufactured in very complex shapes with high dimension accuracy. Bonded magnets find applications in several industries such as automotive, electronics, consumer electronics, electrical appliances, medical, and power generation. The report estimates and forecasts the bonded magnet market on the global, regional, and country levels. The study provides forecast between 2017 and 2025 based on volume (tons) and revenue (US$ Mn) with 2016 as the base year. The report comprises an exhaustive value chain analysis for each of the product segments. It provides a comprehensive view of the market. Value chain analysis also offers detailed information about value addition at each stage. The study includes drivers and restraints for the bonded magnet market along with their impact on demand during the forecast period. The study also provides key market indicators affecting the growth of the market. The report analyzes opportunities in the bonded magnet market on the global and regional level. Drivers, restraints, and opportunities mentioned in the report are justified through quantitative and qualitative data. These have been verified through primary and secondary resources. Furthermore, the report analyzes substitute analysis of bonded magnets and global average price trend analysis. The report includes Porter’s Five Forces Model to determine the degree of competition in the bonded magnet market. It comprises qualitative write-up on market attractiveness analysis, wherein products, processes, applications and countries have been analyzed based on attractiveness for each region. Growth rate, market size, raw Process availability, profit margin, impact strength, technology, competition, and other factors (such as environmental and legal) have been evaluated in order to derive the general attractiveness of the market. The report comprises price trend analysis for bonded magnets between 2017 and 2025. The study provides comprehensive view of the bonded magnet market by dividing it into product, process, application and geography. The bonded magnet market has been segmented by product into rare earth bonded magnets, ferrite bonded magnets, and hybrid bonded magnets. Rare earth bonded magnets are further sub-segmented as isotropic and anisotropic; and ferrite bonded magnets are sub-segmented as plastic ferrite bonded magnets and rubber ferrite bonded magnets. Based on process the market is segmented as calendaring, extrusion, injection molding, and compression bonding. Based on application the market is segmented as automotive, electronics & electrical, industrial, and others (medical, power generation etc. ).The segments have been analyzed based on historic, present, and future trends. Regional segmentation includes the current and forecast of bonded magnet in North America, Europe, Asia Pacific, Latin America, and Middle East & Africa (MEA). Key countries such as the U.S., France, Germany, Italy, the U.K., China, India, ASEAN, South Africa, Mexico, and Brazil have been included in the study. Market segmentation includes amount of bonded magnet consumed by product, process, and application in all the regions and countries. The report covers detailed competitive outlook that includes market share and profiles of key players operating in the global market. Major players profiled in the report include Arnold Magnetic Technologies, Allstar Magnetics, Alliance LLC, Neo Magnequench, Viona Magnetics etc. Company profiles include attributes such as company overview, number of employees, brand overview, key competitors, business overview, business strategies, recent/key developments, acquisitions, and financial overview (wherever applicable). The bonded magnet market has been divided into the following segments.